Thanks to our unique costume ideas, this was a fun Halloween. Kim saw the picture for the 2010 winter Olympics and thought to make a coupled theme. Took a bit of brainstorming but it worked great. Kim as the Inukshuk took a lot of boxes and fitting (prep work). 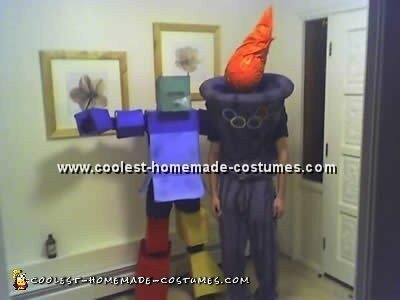 This costume turned out great. We made the costume so that she will still have great move ability for the night (exposing the joints) and still have the same features as 5 solid rocks. She was wrestling outside at the end of the night and still came out with only scratches for damage on the boxes. The torch was a huge project for me. I started with a swimming pool floatie (those round long ones for kids) made a basket from a garbage bin and foam for the top half. I actually started with the entire thing as a one piece and decided it would look much better more fitted to my legs. I used my pants I was wearing and made a pair of pants with the material I had. (I have to mention that because that was a proud moment for me to discover how I can figure something like that out and produce a decent product for Halloween standards anyway). After some spray-paint accessories and spray-paint I had a finished staff. 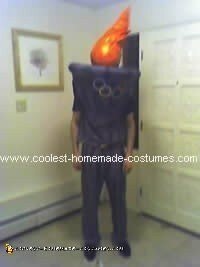 The flame head is made of a child astronaut helmet, witch hat, foam and orange material. I originally envisioned a smooth texture for the flame but I really like how the fabric glued on made it look more like a flame. We received many compliments for our unique costume ideas.